To view our services, please click on the name of the one you wish to see. To close it, just click the name again. If you'd like to see our treatments all together, click the link below for our spa menu. 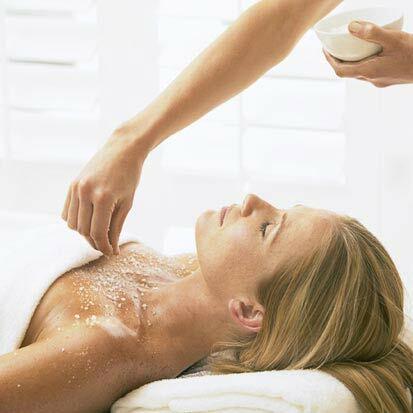 Treat your entire body to refreshing exfoliation with one of our many body treatments. To prevent sensitivity on freshly shaven skin, it is not recommended to shave on the day of an exfoliation treatment. Made with the finest salt grains and rich Vitamin E rice bran oil, this treatment is designed to remove dead skin cells and brighten skin. A shea butter lotion scented with lavender helps soothe dry skin. A silky brown sugar scrub made with Kentucky Bourbon gives a relaxing exfoliation that renews and tightens the skin. An application of rich shea butter whipped from golden organic honey and vitamins locks in moisture and deeply hydrates skin leaving it soft and smooth. A blend of essential oils and fine sea salts are brought together through massage to increase the body’s lymphatic flow and stimulate circulation. Steamed towels remove the mixture and your back, neck and shoulders are massaged to ease away tension. Illuminate your body with this two step exfoliation treatment. Bamboo and fruit extracts buff off dead skin cells with a scrub while a multi-acid peel refines texture and brightens the skin. Finished with a vitamin packed firming cream with shea butter and nutrient rich algae that is applied to your body. Your skin will be left brighter, tighter and nourished. An aromatic getaway that takes you through groves of citrus smoothness. Designed to tone and improve elasticity, an allover body scrub prepares skin for an application of cactus toning gel. Removed with warm towels, deeply hydrating agave nectar oil seals in moisture. Lastly, you are nested under a warm, cozy blanket as you enjoy a relaxing facial massage, leaving you completely renewed. Begin with a dry brushing to exfoliate and stimulate circulation followed by an all-natural, live Spirulina Algae mixed with organic ginger oil. This seaweed treatment imparts essential vitamins, minerals and protein to nourish and detox the body. Warm towels remove the masque and application of multi-vitamin firming créme aids in purifying as you are wrapped in warm blankets to soak up the goodness. 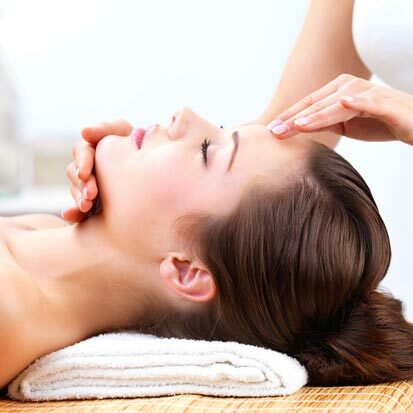 Continue with detoxifying properties as you enjoy a mini facial and scalp massage to complete your journey. Inhale the calming and balancing benefits of wild lavender in this completely balancing and rejuvenating spa experience. To begin, earthly minerals are combined with lavender’s healing properties in an invigorating full body therapy. Following is a back, neck, and shoulder massage with Lavender Oil and warm healing stones. Nourish and relax inside a warm cocoon while a luxurious foot and pressure point scalp massage complete this head to toe treatment. Awaken the senses with the signature aroma of Neroli essential oil in this deeply uplifting experience. Balance the spirit with dry brushing followed by a eucalpytus-infused body scrub to remove dead skin cells. Enjoy a foot cleansing ritual with massage and a luxurious application of Neroli Oil, leaving your body nourished. As you are cocooned in warm blankets, enjoy a mini facial with acupressure and a scalp massage to complete the ultimate skin hydration and body revitalization. Completely renew your body and mind with this signature service. Begin with a body therapy treatment using a heated clarifying mud masque to purify and balance. Warm towels are used to remove the masque. You are then treated to our Labyrinth Heated Stone massage. This treatment concludes with a cocoon of warm blankets and a chilled stone facial massage carrying you away to experience marvelous restorative and healing effects. Stimulating essentials oils of eucalyptus and camphor are blended with therapeutic sea salts to exfoliate, invigorate and remineralize the skin. Warm towels dipped in a Mineral Wellness Soak remove the scrub and you are treated to an application of Organic Grapefruit & Black Pepper Oil to detoxify and leave skin nourished, and luxuriously soft as well as energized. Evensong Spa has a variety of facial skin care choices. Should you be wanting exfoliation, anti-aging care or something refreshing, Evensong offers a service to fit your unique facial skin care needs. An organic plant-based, deep-cleansing facial with an enzyme exfoliation and customized masques for your skin type. Botanical serums and boosters help clarify, nourish and balance your skin. Extractions will be performed if needed. Includes a muscle relaxing facial massage, a hand and arm massage, finished with eye cream, lip balm and moisturizer. Tailored to address oily, congested skin prone to breakouts. An exfoliating multi-acid peel will renew and improve the surface texture of your skin while decreasing oil and debris in the pores. A 16-point acupressure massage will increase circulation and flush the skin of toxins. A customized masque is applied to balance and nourish the skin. Extractions performed if needed. Finishing with a skin correcting serum, eye cream, moisturizer, sunscreen and lip balm. Designed to reduce the appearance of dark spots and uneven skin tones. A blend of organic ingredients is used to lighten and help correct sun damage, including licorice root, Vitamin C and stone crop. Custom masques will firm, brighten and increase hydration while suppressing melanin in the skin. Extractions performed if needed. Finished with an SPF moisturizer with natural Hydroquinone alternative to reduce age spots, eye cream and lip balm. A decadent and luxurious facial that boosts collagen, firms and deeply hydrates the skin with protein rich caviar extract and powerful antioxidants. Age defying nutrients smooth fine lines and improve texture. A unique red algae masque provides wrinkle reduction and instantly restores radiance. Results are immediate leaving skin looking supple, healthy and luminescent. Designed for the most sensitive, easily irritated skin. Organic stone crop is used throughout the facial for its anti-inflammatory properties while calming and brightening the skin. Gentle enzymes will exfoliate without irritation to enhance the skins texture. 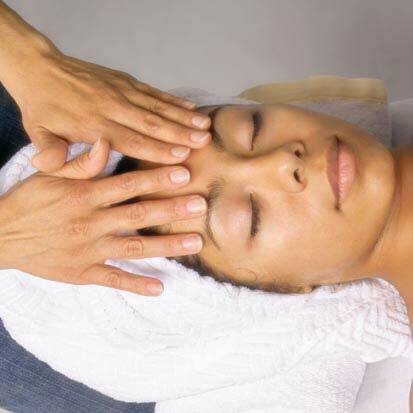 Take pleasure in a relaxing facial massage to soothe and tighten skin. Finished with moisturizer, eye cream and lip balm. The ultimate deep cleansing system will deliver peptides to assist with regeneration while brightening the skin and clearing pores. Extractions performed if needed. Facial masques work together to boost collagen, plump and reduce the appearance of fine lines. Enjoy a hand, arm and foot massage as well as hot and cool stones incorporated into a deeply relaxing facial massage. Customized boosters and facial serums firm and nourish your skin followed by eye cream, lip balm and moisturizer. An ultra-oxygenating vitamin-rich super berry facial will renew and lighten the skin. Includes a multi-acid peel for the face, neck and hands along with an exclusive muscle-easing facial massage using concentrated nourishing plant essence oils. Extractions performed if needed. A cooling and balancing masque will calm and hydrate as you enjoy a foot massage. Pores are tightened with ice globes and finished with collagen boosting serum, moisturizer and lip balm. Looking for a quick pick-me-up for the face? This is just what you need. A gentle cleanse followed by an exfoliating peel will remove excess oil, enhance surface texture and aid in fine line reduction. Essential oils are massaged into the skin followed by eye cream, moisturizer and lip balm. Designed for men in the express lane. Experience a gentle exfoliation, hot towels and skin balancing moisturizer. Includes a face and scalp massage. A purifying facial designed specifically for the special skin care needs of men. A gentle enzyme exfoliation with steam refines the pores while a non-pore clogging anti-aging hydration masque soothes the skin. Extractions performed if needed. Includes a facial massage with essential oils, hot towels, moisturizer and eye cream. Brightening eye cream is used during a lymphatic massage around the eye area, followed by cold stones to help reduce puffiness. Cooling eye rescue patches are applied to hydrate and diminish fine lines around the eye area. Cannot be performed with Express Refresh Facial. Within minutes three problem areas are firmed and instantly lifted. Smile lines are plumped, crow’s feet around the eyes are smoothed while the neck and jawline are firmed and lifted. Great for special occasions. Treat your lips to a 3-step organic treatment leaving them plump, smooth and antioxidant rich. Featuring papaya enzymes, shea butter and citrus to give your lips a satin finish. A multi-acid peel will be applied to the entire area whether you are looking to retexture, clarify or brighten the shoulders and décolleté. This soothing treatment massages a blend of lightly scented warm oils on the scalp, neck and shoulders. This peaceful journey includes a warm towel and pressure points to relieve tension, leaving you in a deep state of relaxation. Enjoy a specialized treatment using gentle, rhythmic techniques, pressure point stimulation, essential oils and cool stones on the neck, and face to speed up lymph flow. Effective in the reduction of sinus problems, allergies, puffy eyes, under eye circles, and certain skin conditions like rosacea and acne. 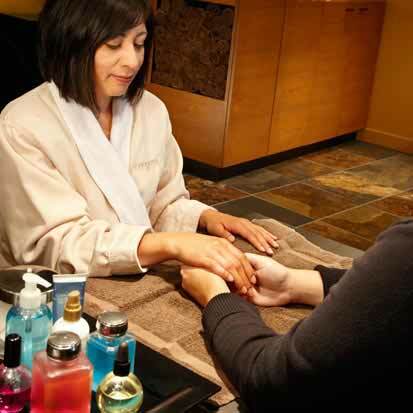 Our Green Lake spa services include a variety of massage therapy options. Whether you’re simply looking for complete relaxation or to soothe specific muscle pains, Evensong therapists have a massage for you. We welcome guests to book any two massages at the same time frame to take use of our private couple’s suite – share the experience with a partner or friend. Soothing music and aromatic scents will carry you into a tranquil state. Our signature massage begins with heated stones placed on key energy points of the body to instill a sense of peace journeying to a state of relaxation for the body and mind. Continue the journey with a relaxing full body massage using your choice of our aromatic essential oils leaving you completely relaxed, centered, and renewed. Smooth heated stones are combined with soothing massage techniques and your choice of aromatherapy to promote grounding, balancing, and a feeling of luxurious comfort. The heat from the stones allows your muscles to release areas of tension and fatigue while instilling a sense of healing within you. Inspired by Indonesian tradition, this massage provides you with a unique experience by combining a variety of massage techniques including tapotement, rocking, kneading, pressure point and hot stone therapy, as well as palming. Your therapist uses a very slow and rhythmic pace combined with essential oils to ease both body and mind into a harmonious state of tranquility. Experience the ancient art and therapy of bamboo massage. Known for its healing properties, bamboo works at all levels to balance, calm, and energize you physically, mentally, and spiritually. Your therapist uses warm bamboo tools to roll and knead the tissue while using essential oils to create a deep sensation of health and well-being. Renew and refresh not only your body, but also your energy, mind, and spirit with the uplifting essence of neroli from head to toe. This therapeutic treatment begins with a calm mind and energy balancing ritual. Next, a full body massage incorporates tension release, breathing techniques, pressure point foot and scalp massage, as well as heart chakra balancing using a rose porfyr stone which is yours to keep following the treatment. Experience the numerous benefits of massage including pain and stress relief, mental clarity, increased circulation and immunity, as well as better posture and flexibility. Your therapist uses traditional Swedish techniques consisting of a light to medium pressure combined with soothing movements and aromatic oils to immerse your mind and body into a deep sense of relaxation and well - being. This customized and therapeutic treatment begins with a consultation to address specific areas of tension and fatigue. Your therapist uses a combination of eucalyptus, peppermint, wintergreen, and ginger oils to reduce inflammation in the joints and muscle tissue. Using a customized pressure that’s just right for you and focusing on specific areas of concern instills a deep sense of healing and renewal within your mind and body. Prenatal massage is tailored specifically to the needs of pregnant women and their changing bodies. Massage is a healthy, complementary choice for prenatal care and includes numerous benefits. Our trained therapists will assist in reducing back and joint pain, easing muscle tension, decreasing edema, increasing circulation and immunity, and reducing stress and anxiety. Your therapist will also address specific areas of tension that you may have, putting your body and mind at ease. Learn more about our Babymoon Package which features the Mother Me Massage. Ease stress and tension with this therapeutic and focused massage. Concentrating on the back, neck, and shoulders, customized pressure, essential oils, and aromatic hot towels assist in easing muscle aches and pains. Customize your massage for pre- or post-game conditioning. Whether you are a weekend warrior or a touring professional, including golf massage therapy as a regular part of your training program can help you to avoid injury and enhance golf performance. Your therapist uses therapeutic oil while targeting the specific muscle groups utilized during your round. During this Swedish massage our therapists use a nourishing organic sunflower oil enhanced with a refreshing, sophisticated organic blend of grapefruit, black pepper, mint, lemon and juniper essential oils, and Ayurveda manjistha extract to offer detoxifying and revitalizing aromatherapy benefits. This uplifting essence helps detoxify by boosting lymphatic activity with anti-inflammatory properties to aid in muscle recovery. Eliminate muscle fatigue and discomfort with this area-focused therapeutic massage. A muscle balm rich in minerals works to release tension at its source. Balance the body while rejuvenating your mind and spirit. This ancient therapy consists of a series of essential oils applied to specific energy zones of the body along with energy balancing massage techniques bringing your body, mind, and spirit to a harmonious place of peace and comfort. Mention seeing this or our new Words of Wellness and receive $10 off the added Raindrop Therapy enrichment when you check out at Evensong Spa. A luxurious and relaxing spa experience that combines massage with steaming hot towels steeped in ginger oil which contains a high level of antioxidants working to reduce inflammation and anxiety while calming and nourishing the body, mind, and spirit. Experience a rejuvenating and therapeutic treatment concentrating on pressure points on the feet. Pressure point massage techniques help balance and detoxify, reducing tension throughout the entire body, relieving headaches, sinus congestion, and many stress-related conditions. A combination of chilled stones and specific acupressure points eases your body and mind into a calm and cool aura. Assists in reducing tension, inflammation, sinus congestion and jaw discomfort. Hot water baths promote relaxation, stimulation and detoxification. Choose from three Daycholah Water Cure flavors paired with a mineral soak. Perfect as a single service or added as a bath remedy to enhance a massage or body treatment. Organic pure pressed lavender oil along with vitamin E provide a sense of balance while moisturizing the skin. Great for inflammation and irritated skin. Essential oils energize and invigorate the senses while the organic formula reduces joint pain and muscle aches. This blend will nourish and hydrate the skin leaving it silky smooth..
Nutrient rich blend of organic neroli, coconut oil and jojoba delivers a silky feel to the skin and calms the senses. This oil also promotes the regeneration of new cells..
Hand-harvested mineral crystals elevate the bathing experience into a detoxifying, remineralizing, muscle relieving wellness treatment. This cure contains a perfect, rare balance of sixty essential minerals and trace elements to deeply nourish and re-balance the body. Added to your bath is an Organic Grapefruit & Black Pepper Oil to increase detoxification, reduce inflammation and nourish the skin with just the right amount of stimulation for your senses. Choose a manicure, pedicure or both. Our expert technicians will have your nails polished in no time. With all our nail services, please inform us if you currently have Shellac or other no-chip gel polish on your nails, to allow time for removal. Please schedule a gel polish removal if you are currently wearing any type of gel polish. Gel applies like polish and lasts with a high gloss shine for up to two weeks. Say goodbye to nicks, chips and smudges. Service includes cuticle work and nail shaping. This manicure is perfect for reshaping the nails and tidying up cuticles. A light citrus sugar scrub exfoliates the skin, followed by a hand and arm massage using a deep hydrating lotion. Nails are polished or buffed to a shine. This manicure begins with a deep cleanse and exfoliation to soften dry calloused skin. After a meticulous nail and cuticle detailing, a deep conditioning lotion is massaged into hands and forearms. Finish the nails with vigorous buff to a shine. A deluxe ‘facial for the hands’. Begin with nail and cuticle detail followed by a raspberry and vodka salt scrub to slough off dead skin. Enjoy an avocado masque rich in vitamins and packed with key fatty acids to deeply hydrate your hands. Tension is relieved with a hand and arm massage with quinsyberry oil to plump and seal in moisture. Nails are polished or buffed to a shine. 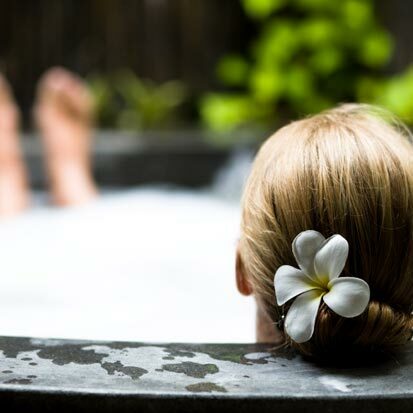 Our signature pedicure starts with a relaxing cranberry citrus soak followed by nail and cuticle detail. A citrus sugar scrub exfoliates leaving your skin silky smooth, with a relaxing foot and calf massage to follow. Nails are polished or buffed to a shine. Take a load off with this pedicure designed to relax those overworked, tired feet after your day on the course. Start with a deep cleanse and exfoliation, and enjoy a deep calf and foot massage. Nails are groomed and buffed. Relax in a warm nectar milk bath to reduce inflammation and soften dry heels followed by a sweet cream salt scrub to exfoliate and invigorate the legs and feet. Feet are wrapped in warm towels as a masque deeply hydrates and an application of honey glaze with live papaya and pineapple enzymes smooth the skin. Finished with a foot and calf massage leaving feet refreshed and renewed. Nails are polished or buffed to a shine. Experience wellness as you begin with a salt soak to re-mineralize followed with a creamy scrub to exfoliate the calves and feet. A spirulina algae masque aids in softening the heels and nourishing the skin and a deeply relaxing heated stone massage relieves muscle tension. Enjoy an application of therapeutic cooling crème to improve circulation and joint aches. Nails are polished or buffed to a shine. Your journey begins with a warm bath of Himalayan salt to soften the heels. A smoothing enzyme scrub will exfoliate and remove dead skin cells and soften calluses. Feet are then wrapped in warm towels with a purifying foot masque. A slow relaxing massage for the feet and calves will ease muscle tension followed by a foot placement on heated Himalayan salt blocks to aid in detoxification and re-mineralization as you enjoy a hand and arm massage. Finish with a paraffin treatment to seal in hydration. Nails are polished or buffed to a shine. Enjoy a pedicure and manicure that includes nail and cuticle detail. Begin with a caramel coffee sugar scrub, used to increase your circulation and give a tightening effect to the skin, followed with a caramel milk lotion massage to deeply hydrate and improve elasticity. Both fingers and toes are polished or buffed to a shine. Begin with a warm Mineral Wellness foot bath to help remineralize and soothe achy feet. Next, enjoy an invigorating exfoliation scrub made with mineral rich sea salt and essential eucalyptus oil leaving skin energized. End with an Organic Grapefruit & Black Pepper Oil foot and calf massage to aid in detoxification and deeply hydrate the skin leaving you renewed and refreshed. An express service that shapes nails moisturizes hands and is completed with a full polish application. This enrichment may be incorporated to enhance any nail treatment. Cannot not be booked alone. Our single use paraffin treatment delivers heat and hydration for soft, smooth skin and protection from dry, rough, achy or irritated hands or feet. Relax and revel in warm individual packs of therapeutic paraffin infused with 11 vitamins vital for healthy skin. For your pick-me-ups and special occasions, Evensong Spa offers a variety of hair treatments and makeup services. Our hair treatments range from cut and color for the latest trends to blow-dry and style for an elegant up-do. Seek our makeup expertise to renew or finish off your look. This service includes shampoo and style with a blow dryer and round or paddle brush for a voluminous, polished look. Add the option of a curling or flat iron. Look your best for any special occasion! Please arrive with clean, dry hair or reserve a shampoo/blow-dry in advance. We suggest wearing button-down attire to the spa for any special occasion hair reservation. coats the hair, preventing further damage. The results are smooth, silky, shiny and straight hair. This treatment includes a full-size shampoo and conditioner. This unique in-salon treatment immediately addresses the frizz issues with your hair. The formula is designed to be a short-term solution to battle frizz as results can last up to 6 - 8 weeks with proper home care. Indulge in a deep condition treatment to help bring back your natural shine and smooth your hair. Available as an add-on to any hair service. Have our professional makeup artist complete your look for any occasion. Choose from several waxing options including face, arms, eyebrow, bikini, legs and under arm. Please call us for a complete list of waxing services and prices. Relax, energize and enhance your newlywed glow with these wedding party spa packages, specifically designed to help you look and feel your best on your big day! We have provided specially-built packages for the bridal party, your groom or yourself. Choose from these options or customize your perfect pre-ceremony escape. All pre-set Wedding Packages include gratuities and spa access fees. Please note additional fees may be incurred depending on length of hair and intricacy of styling. Leave the work to the beauty and relaxation experts. This package includes a Trial Hair Consultation and Style, Trial Makeup Application, Wedding Day Hairstyle, Wedding Day Makeup Application and the lipstick of your choice for touchups during your big day. Take some time to refresh your mind and body before you say "I Do." Indulge in a Full Body Exfoliation, Back, Neck, and Shoulder Massage, and a Perk-Me-Up Mani-Pedi. Let your man shine! With this package, your handsome groom receives a Back, Neck and Shoulder Massage, a Men’s Express Facial and Grooming Hand and Foot Detail. He’ll never look better! 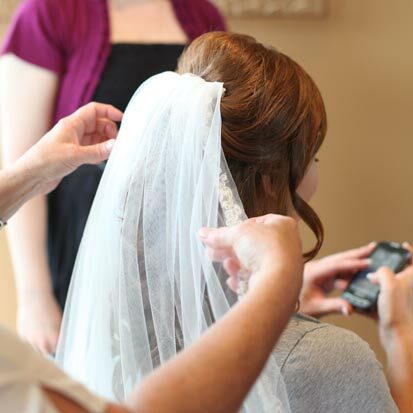 Treat your bridesmaids to a Specialty Hairstyle and Makeup Application. Additional fees may be incurred depending on length of hair and intricacy of styling. Evensong Spa is the perfect location for a bachelorette party spa retreat, and we'll create a customized package just for you. Call us at 920.294.3347 to explore the many options available for your party. All packages include spa admission, a spa healthy cuisine lunch, tax and service charge. All treatments within the package must be scheduled for the same individual on the same day and substitutions are not allowed. Overnight accommodations at Heidel House Resort can be added to any spa package. 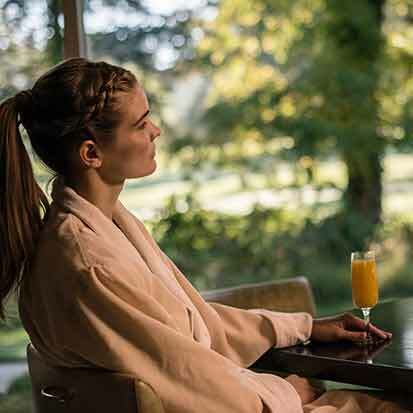 Rejuvenate your spirit with our signature Inner Journey Massage and Evensong Seven Circuit Facial. Finish with an Evensong Signature Manicure and Evensong Signature Pedicure. Package includes spa admission, a spa healthy cuisine lunch, tax and service charge. All treatments within the package must be scheduled for the same individual on the same day and substitutions are not allowed. Overnight accommodations at Heidel House Resort can be added to any spa package. Relax and renew with the perfect combination of our Firming Peptide Facial and Milk & Honey Pedicure. Head to toe bliss! Immerse yourself in pure relaxation. This package is all about the body and includes a Honey Lavender Salt Glow and Bamboo Massage with our Tranquility Scalp Treatment. Sink into serenity with our Neroli Blossom Sensory Massage, paired with our Antioxidant Infusion Facial.